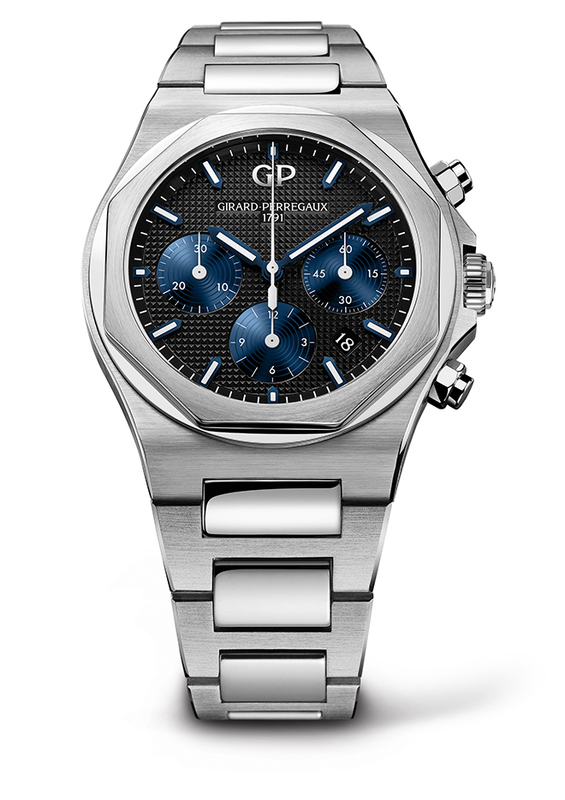 t may not be the first watch on every budding watch collector’s mind, but Girard Perregaux Laureato should be the timepiece you eventually choose to show you truly understand watches. 1972 was a pivotal point. Deep in the midst of a rising tide of Japanese quartz watches, the first real luxury sports watch was born. Though stainless steel, it was more expensive than most of the gold watches of the era. A scant four years later, another brand would launch its own interpretation of the new genre, birthed from the same designer, both timepieces, emblematic of their individual houses, were inspired the concept of a porthole. Though the details were very different, cynics can be found on every corner of earth and in every period of history, for any subject matter. Some declared one creation to be a copy of another. Perhaps its the bezel, maybe it’s the blue dial or the integrated bracelet, nevertheless, regardless of what design elements we choose to draw the line at when it comes to defining an “inspired work” or “homage”, the perspicacious maxim is that everything under the sun has been done – there’s nothing that is truly original, every great work of art stands on the shoulders of those that went before it. That said, born in 1975, the middle child Laureato is not derivative. To accuse it of such a creative sin, would be to imply that the emblematic case defined by a polished octagonal bezel fitted on an integrated case feels lazy, which it doesn’t; and more egregiously, is a less expensive facsimile than that the other luxury sports timepiece which came before for it, which it isn’t. The Laureato is not a compromise, to choose her is to acknowledge it for what it represents during that tumultuous period in Swiss watchmaking. The first Laureato was a thin quartz watch. While we celebrate, with hindsight, the “bravado” of the brands in the era who stuck to their guns, Girard Perregaux was one of a handful of pioneers on the frontlines keeping Swiss watchmaking alive while making a determined counter-offensive against the Japanese watch industry. Their first salvo, the Elcron quartz calibre which made its debut in 1970 was a laudable effort in clawing back some lost ground and market share. But it was the GP-350 quartz calibre unveiled in 1971 which would define the benchmark for precision quartz frequencies to date. In less than a year, quartz frequencies would go from running at 8,192 Hz to 32,768 Hz, a standard which all quartz movements, even those of the high precision variety, still keep today. In terms of provenance, the Laureato is a hallmark of that juncture between that Swiss adventure into Beta 21 quartz technology, and the many innovations heralded by Girard Perregaux which made quartz watches as precise and as long lived as we now understand. But life, as in watches, is about cycles, and mechanical watches and handmade suits are en vogue and resurgent. 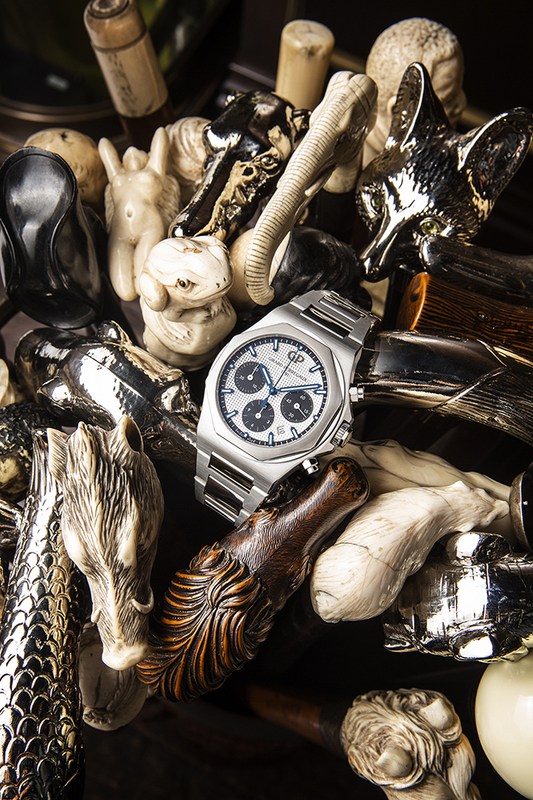 In 1995, the Laureato family finally gained a mechanical variant, a manufacture automatic calibre 3100. Compact, and even somewhat slim by modern standards, the 25.6mm x 3.36mm calibres formed the mainstay for the Laureato line. Incidentally, so well conceived and robust was the Laureato’s foundational movement that it became the go-to base calibre for other brands like Vacheron Constantin (for their first Overseas collection) and at a later date, even chosen by Max Busser for his MB&F timepieces. 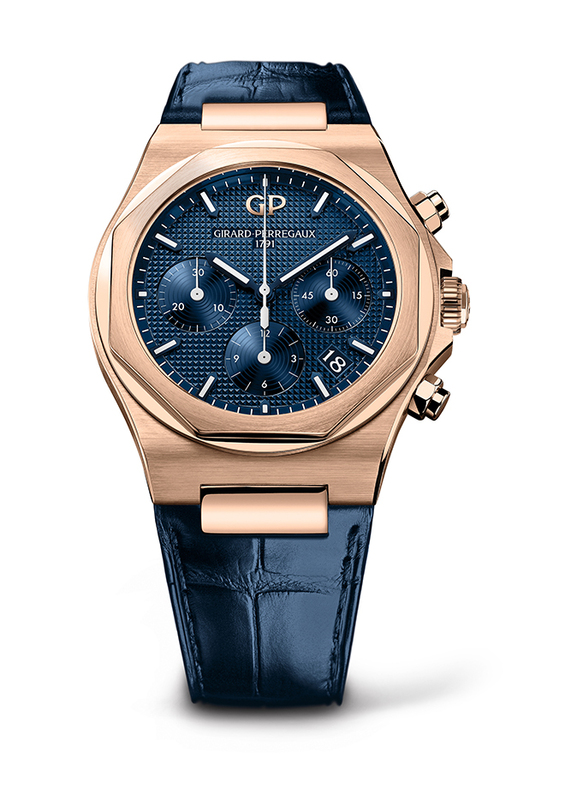 In essence, therein lies the philosophical and horological allegory to be made in discussing its history of a Girard Perregaux in-house movement being used by other manufactures for their own in-house modifications; such as the primacy and excellence in even the basic Laureato calibre over a respectable but perfunctory ETA 2892 that one sees parallels in how in the span of three to four years, Swiss quartz watches went from lagging the then dominant Japanese standard to setting the global standard of what a well made movement, quartz or mechanical, should be. That said, while not exactly a high horology movement ala the pre-Audemars Piguet JLC 2120 movement, the Laureato’s base calibre was good enough even for the highest tiers of Swiss names both independent and group owned, and that’s saying something. 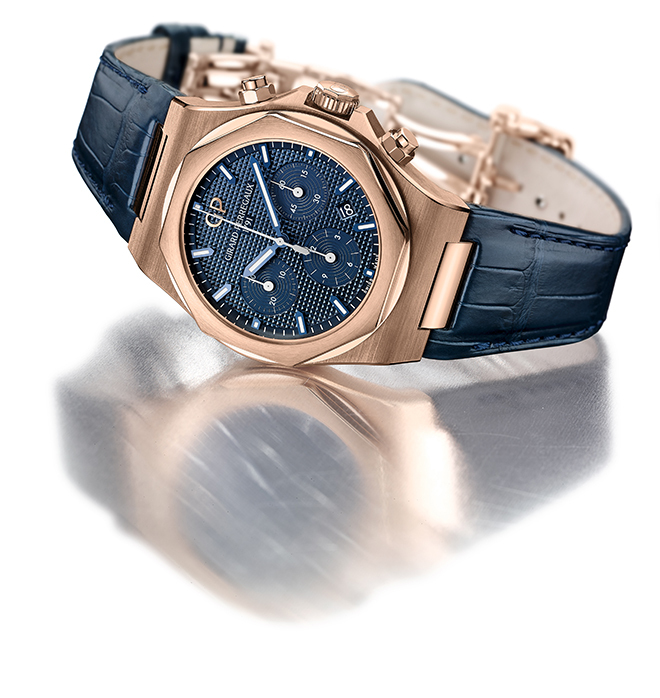 Aesthetically speaking, cursory inspection of the Girard Perregaux Laureato reveals a quiet elegance. Where her competitors express a more aggressive angularity or a more masculine, bold faced, thick bezel, the Laureato opts for slim and subdued silhouette thanks to its refined lines and sublimely managed geometry. What the Maison had hoped to accomplish was something more ethereal, in an age of constant threat from cheaper, thinner, more precise Japanese exports, the Laureato was a vaunted symbol of Swiss modernity in both the technical and creative sense, it was a pioneer of ultra-thin quartz watchmaking, leap frogging her Japanese and Swiss rivals in both technology and aesthetics. Topped with a Clous de Paris or hobnail dial, it’s easy for a watch novice to draw mistaken parallel to a visually similar but technically different, tapiserie dial. Clous de Paris is a heritage decoration of fine Swiss horology and perhaps one of the most recognisable elements on another watchmaking classic – the Calatrava. Thus, to claim it copies the waffle pattern on another luxury sports design, is simply ignorance (at best) or malice (at worst). Celebrating the maison’s 225th anniversary, the new Laureato was launched as a limited edition series of 225 pieces for each dial variant. SIHH 2017 saw a big debut of its legendary Laureato in a small way – by this we mean that rather than execute the iconic timepiece in more contemporary 40 or 42mm proportions, the Maison proved its watchmaking foresight by launching a 38mm edition – icing on cake, it was powered by a descendent of the calibre 3000 lineage – an all new 3300 calibre. 38mm x 10.02mm, the new Laureato re-issue was refreshing post-modern. Engineered very much like the original pre-21st century quartz model with slightly updated design codes that reinforce its visual identity. Subtle bevelling on case flanks and alternating brushed and polished surfaces on the new Laureato collection further emphasise Girard Perregaux’s deft mastery of not just calibre manufacture but artisanship and decoration. Given the minute proportions of each design element, the transitions between the alternating decorative techniques are flawlessly executed, everything is attractive without being overbearing – think Miranda Kerr rather than Kim Kardashian. The Laureato isn’t just emblematic of that 70s sports luxury genre, it subverts it by being something deeply considered and chosen, not just for its looks but really by what it represents – passionate study and execution into two divergent directions of watchmaking – futurist and classical; why be a mere icon when one can be an iconoclast as well? 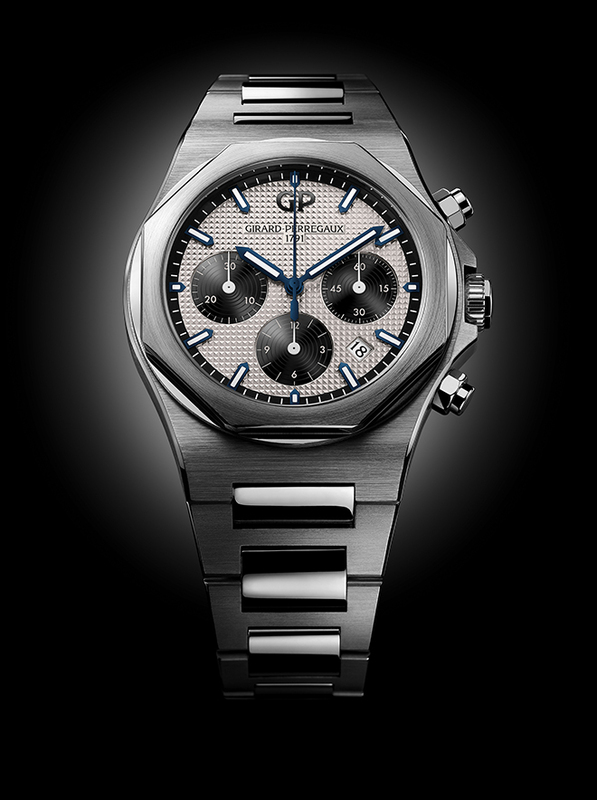 If it appears that the new Laureato chronograph in steel “glows” – it’s no mere trick of the eye or illusion of light. Higher chromium content in 904L steel used by Girard Perregaux not only bequeaths superior corrosion resistance but the hard-wearing formulation of steel also holds exceptional radiance after polishing. The understanding is that the hardness of 904L grade steel keeps its shine, especially when it comes to satin-brushed surfaces since its harder for each micro abrasion to lose its texturised appearance. When clothed in 18K pink gold, the Laureato becomes something dressier, the equivalent of Bond going from adventuresome safari attire to tuxedo. Making a return is that unmistakable dial bearing the “Clou de Paris” hobnail motif; In the case of the Laureato Chronograph, the expanse of small raised pyramids occupying the watch face and catching the light os punctuated with the snailed subdials which allow the two small counters and small seconds to contrast against the dial-scape. Available in variety of models including a 45mm tourbillon Laureato powered by an automatic micro-rotor movement, the caliber GP09510, the timepiece literally serves as a bridge to the Maison’s exemplary heritage thanks to its tourbillon at six o’clock and its oversized bridge connects to two arrow-shaped ends, in reference to Girard Perregaux’s other signature icon – Tourbillon with Three Gold Bridges. The collection’s new mainstay, introduced in 2017, is the 42mm stainless steel Laureato equipped with the new automatic calibre GP01800. Laureato’s introduction into watchmaking lexicon, a year before Patek Philippe’s own Nautilus, IWC’s original Ingenieur and Hysek designed Vacheron ref. 222, gives the collection indisputable design provenance. 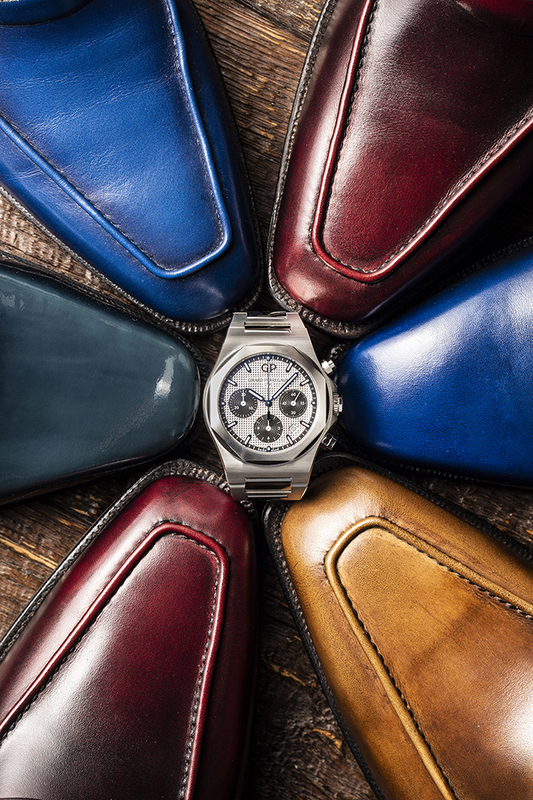 Designed by a Milanese architect, following design cues more architectural than nautical, the return of the Laureato completes Girard Perregaux’s contemporary story in a way that is worthy of its namesake, Il Laureato, otherwise translated, The Graduate, from that titular Dustin Hoffman movie. After all, there’s no better watch to graduate and show one’s horological chops spanning that tumultuous history to its modern resurgence.